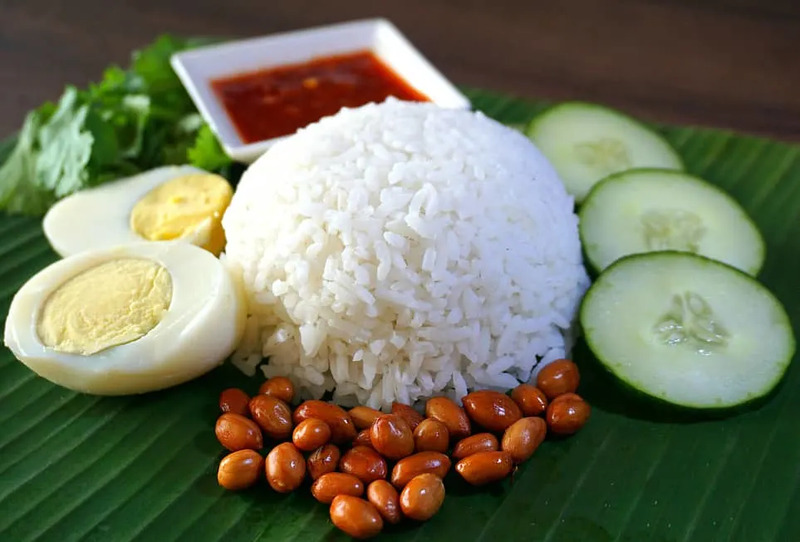 Nasi Lemak, or coconut rice, is a Malaysian side dish served throughout the day. Nasi Lemak is so popular that it is considered the country’s national dish. The rice is lightly flavored with ginger, coconut milk and pandan leaves. Pandan leaves are very common in Malaysian cooking and add a light floral note to the dish. You can find them in Asian markets, either fresh or frozen. But if you can’t find them just omit them from the recipe. It is often served with sliced cucumbers, a hard-boiled egg, and fried anchovies, roasted peanuts and spicy Sambal Sauce (available in the Asian Food Section in most markets). Simple Sambal Sauces can be very basic, made with just hot chile peppers, vinegar and salt. More complex versions of Sambal Sauce have other ingredients such as garlic, shrimp paste, and lemongrass. The simple version is fine for the purposes of this recipe. This rice dish goes well with other Malaysian dishes, such as Chicken Rendang or Ayam Masak Merah. Also, give it a try with other coconut milk based curries, such as Massaman. If you are already a fan of Malaysian foods, give our recipe for Beef Laksa (beef coconut curry noodle soup). so delicious! Roasted Peanuts, Fried Anchovies, Cucumber Slices, Hard Boiled Eggs, Sambal Sauce, as accompaniments. Add the water, coconut milk, rice and ginger to a sauce pan over and bring the pan to a boil. 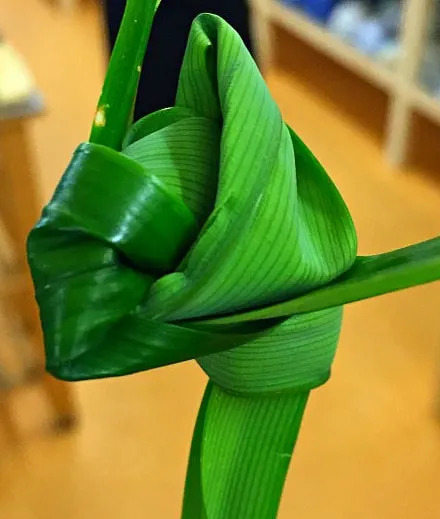 Tie the pandan leaf into a knot and add it the pan. Reduce the heat to simmer and cover. Continue to cook until the rice has absorbed all of the liquid and is cooked through (approximately 20 minutes). For traditional Malaysian Nasi Lemak, garnish with hard boiled eggs, fried anchovies and roasted peanuts. No Nasi Lemak would be complete, however, without some spicy Sambal Sauce on the side. If you enjoy this recipe, try another favorite Malaysian Rice dish, Nasi Tomato (tomato rice). i have never heard of this dish..but the idea of ginger and coconut in rice sounds delicious! !